The high point of the abacus calendar is the All Japan Soroban Championship, which took place earlier this year in Kyoto. And the high point of the championship is the category called “Flash Anzan” – which does not require an abacus at all. Or rather, it requires contestants to use the mental image of an abacus. Since when you get very good at the abacus it is possible to calculate simply by imagining one. In Flash Anzan, 15 numbers are flashed consecutively on a giant screen. Each number is between 100 and 999. The challenge is to add them up. Simple, right? Except the numbers are flashed so fast you can barely read them. I was at this year’s championship to see Takeo Sasano, a school clerk in his 30s, break his own world record: he got the correct answer when the numbers were flashed in 1.70 seconds. In the clip below, taken shortly before, the 15 numbers flash in 1.85 seconds. The speed is so fast I doubt you can even read one of the numbers. I’ve often wondered at how 3d visual displays, like Google Glass, are going to change the way we work with and augment data. It may be possible that we can speed up our own performance dramatically alongside computers that we work with. Calculating prodigies are individuals who are exceptional at quickly and accurately solving complex mental calculations. With positron emission tomography (PET), we investigated the neural bases of the cognitive abilities of an expert calculator and a group of non-experts, contrasting complex mental calculation to memory retrieval of arithmetic facts. We demonstrated that calculation expertise was not due to increased activity of processes that exist in non-experts; rather, the expert and the non-experts used different brain areas for calculation. We found that the expert could switch between short-term effort-requiring storage strategies and highly efficient episodic memory encoding and retrieval, a process that was sustained by right prefrontal and medial temporal areas. Inspired by Ribot’s psychological work (1881), they believed in the existence of not one type of memory but several partial, special, and local memories, each devoted to a particular domain. In all arithmetical prodigies, memory for digits is abnormally developed compared with other memories. Inaudi was considered to be an auditory memory-based mental calculator; when memorizing digits, he did not rely onthe appearance of the items or create visual imagery of any kind. Rather, he remembered digits principally by their sounds. Inaudi’s methods of calculation and memorization were original and different from those used by Diamandi, who was a typical visual memory-based mental calculator. The experiments presented in the 1893 article were among the first scientific demonstrations of the importance to psychology of studying different types of memory. The present work gives a translation of this pioneering experimental article on expert calculators by Charcot and Binet, instructive for the comprehension of normal memory. http://www.ncbi.nlm.nih.gov/pubmed/22044611 that people with mild intellectual disabilities (ID) have difficulty in ‘weighing up’ information, defined as integrating disparate items of information in order to reach a decision. However, this problem could be overcome by the use of a visual aid to decision making. In an earlier study, participants were taught to translate information about the pros and cons of different choices into a single evaluative dimension, by manipulating green (good) and red (bad) bars of varying lengths (corresponding to the value ascribed). Use of the visualcalculator increased the consistency of performance (and decreased impulsive responding) in a temporal discounting task, and increased the amount of information that participants provided to justify their decisions in scenario-based financial decision-making tasks. Previous research has demonstrated that people with mild intellectual disabilities (ID) have difficulty in ‘weighing up’ information, defined as integrating disparate items of information in order to reach a decision. However, this problem could be overcome by the use of a visual aid to decision making. In an earlier study, participants were taught to translate information about the pros and cons of different choices into a single evaluative dimension, by manipulating green (good) and red (bad) bars of varying lengths (corresponding to the value ascribed). Use of the visualcalculator increased the consistency of performance (and decreased impulsive responding) in a temporal discounting task, and increased the amount of information that participants provided to justify their decisions in scenario-based financial decision-making tasks. The results suggest that the visual calculator has practical applicability to support decision making by people with mild ID in community settings. Among the many examples of the congenital form are the calendar calculators, who can quickly provide the day of the week for any date in the past; the musical savants, who have perfect pitch; and the hyperlexics, who (in one case) can read a page in 8s and recall the text later at a 99% level. Other types of talents and artistic skills involving three-dimensional drawing, map memory, poetry, painting, and sculpturing are also observed. One savant could recite without error the value of Pi to 22,514 places. Persons with the acquired form develop outstanding skills after brain injury or disease, usually involving the left frontotemporal area. This type of injury seems to inhibit the “tyranny of the left hemisphere,” allowing the right hemisphere to develop the savant skills. Another way to inhibit the left frontotemporal area is to use transcranial magnetic stimulation in normal subjects; nearly one-half of these subjects can then perform new skills during the stimulation that they could not perform before. This type of finding indicates the potential in all of us for the development of savant skills in special circumstances. In the present study, we examined cortical activation as a function of two different calculation strategies for mentally solving multidigit multiplication problems. The school strategy, equivalent to long multiplication, involves working from right to left. The expert strategy, used by “lightning” mental calculators (Staszewski, 1988), proceeds from left to right. The two strategies require essentially the same calculations, but have different working memory demands (the school strategy incurs greater demands). The school strategy produced significantly greater early activity in areas involved in attentional aspects of number processing (posterior superior parietal lobule, PSPL) and mental representation (posterior parietal cortex, PPC), but not in a numerical magnitude area (horizontal intraparietal sulcus, HIPS) or a semantic memory retrieval area (lateral inferior prefrontal cortex, LIPFC). An ACT-R model of the task successfully predicted BOLD responses in PPC and LIPFC, as well as in PSPL and HIPS. No gross anatomical differences were observed. By morphological assessment, cerebral volume (1362 mL) was larger than normative literature values for adult males. The corpus callosum was intact and did not exhibit abnormal structural features. The right cerebral hemisphere was 1.9% larger than the left hemisphere; the right amygdala and right caudate nuclei were 24% and 9.9% larger, respectively, compared with the left side. In contrast, the putamen was 8.3% larger on the left side. Fractional anisotropy was increased on the right side as compared with the left for 4 of the 5 bilateral regions studied (the amygdala, caudate, frontal lobe, and hippocampus). Fiber tract bundle volumes were larger on the right side for the amygdala, hippocampus, frontal lobe, and occipital lobe. Both the left and the right hippocampi had substantially increased axial and mean diffusivities as compared with those of a comparison sample of nonsavant adult males. The corpus callosum and left amygdala also exhibited high axial, radial, and mean diffusivities. MR spectroscopy revealed markedly decreased γ-aminobutyric acid and glutamate in the parietal lobe. Most cultures around the world independently arrive at a decimal system for counting things? Thus, can we say a decimal metric system is necessarily more ‘rational’ than a standard system largely based around numbers like 12 and 16? Ancient Mesopotamian cultures based their numeral system around the number 60, evenly divisible by 12. Computers are set up to do many things in hexadecimal, base 16, rather than the base 10 preferred by its ten-fingered users. It makes best mathematical sense to use numbers most easily divided and factored as a base. Thus a race of aliens with 13 fingers might also create computers that use base 16. If we were to suppose the divine is reflected in the nature of the universe, Would humans in the image of the divine have had 12 or 16 fingers instead of 10? 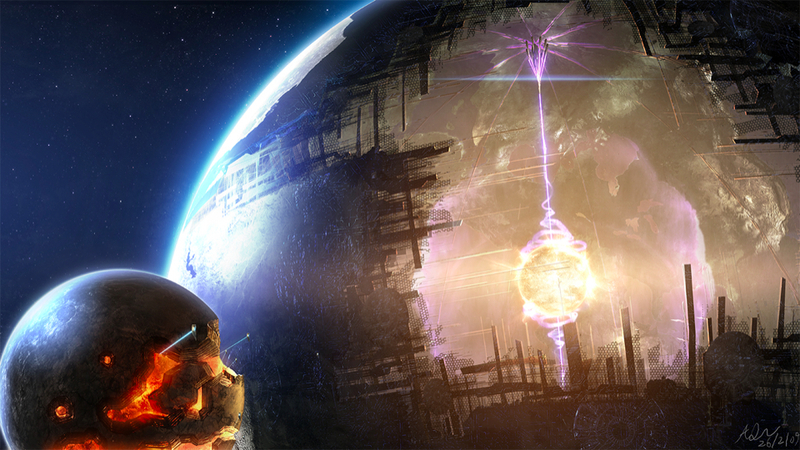 A Dyson sphere is a hypothetical megastructure originally described by Freeman Dyson. Such a “sphere” would be a system of orbiting solar power satellites meant to completely encompass a star and capture most or all of its energy output. 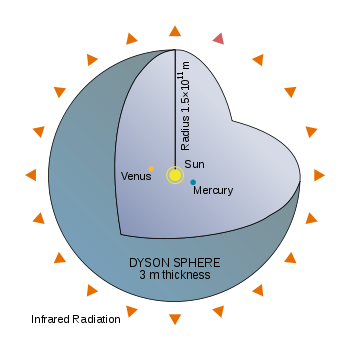 Dyson speculated that such structures would be the logical consequence of the long-term survival and escalating energy needs of a technological civilization, and proposed that searching for evidence of the existence of such structures might lead to the detection of advanced intelligent extraterrestrial life.